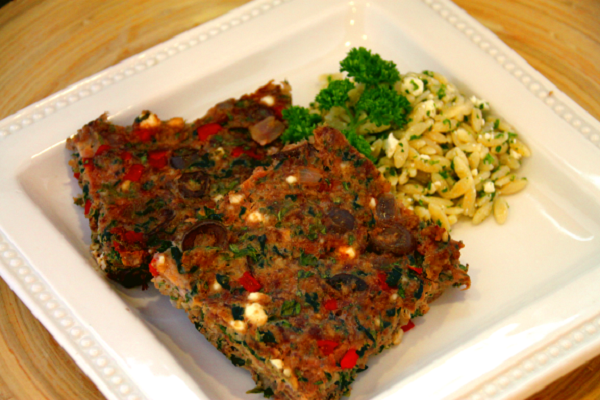 The Greek take on classic American meatloaf. Ground sirloin and turkey together with breadcrumbs, feta cheese, spinach, and olives. Served with a lemon orzo and parsley. 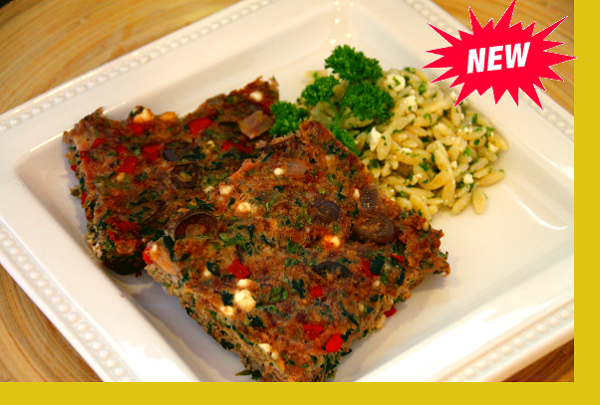 A must try for meatloaf lovers as well as those ready for a meatloaf makeover. Ground sirloin and turkey, breadcrumbs, egg, feta, spinach, olives, red onion, red pepper, parsley, olive oil and spices. Meatloaf: Preheat oven 350°F. Bake Meatloaf in pan uncovered for appx 45 mins until temperature reads 160F on instant thermometer. Let rest 5 mins before slicing. Orzo: Boil water in a large pan. Add orzo and stir occassionaly cooking for 12-14 mins or until it has a firm chewy texture. Drain & combine with dressing.